JuanTax has a significant reason for celebrating this month. It is the first company to be certified by the BIR as an e-TSP provider. Another milestone for the hard-working and talented team behind JuanTax. More than JuanTax though, the real victory goes to the Filipino taxpayers who will benefit from this latest innovation in tax collection. What is the e-TSP Certification Program all about? Electronic Tax Software Provider Certification (eTSPCert) System is a project of the BIR along with the United States Agency for International Development (USAID). This is an online system in which tax software providers and Authorized Agent Banks (AABs) may apply and have their e-filing and e-payment software evaluated, tested and finally certified by the BIR. The BIR has been very selective in the certification process of third party vendors, even ensuring that there are proper guidelines in place. Not every company who applies as an e-TSP provider can pass the rigorous selection process. “It is also our responsibility to ensure that this tax filing and payment software packages conform with the BIR’s data structure requirements and standards for security,” said BIR Deputy Commissioner Lanee David. If you are an individual or corporation with a steady income stream, you will surely be paying taxes regularly. Enforcing tax compliance generates more revenues for the government. Paying taxes therefore should be made more elementary and accessible. The introduction of e-TSP through tax software providers will make filing taxes easier from the usual options like manual, eBIR and eFPS. In the same manner, electronic payments will be facilitated faster with e-TSP through AABs, linking the app of TSPs to the banks. This is the alternative to paying through eFPS, GCash, Landbank’s LinkBiz and DBP’s Pay Tax online portal. The surprising statistic is that 83 percent of transactions are done manually over the counter. In order to eliminate corrupt practices that may arise from human transactions, electronic and digital platforms are necessary. This is a shift to retail transactions from the cash-based over-the-counter payments. The paying behaviour of taxpayers has not changed much though. Getting accredited didn’t come easy for the JuanTax team but adversity doesn’t faze them. They had to prove that they can muster the necessary requirements to be certified. The good news is they passed the scrutiny. With so many options available to file and pay taxes, being a law-abiding citizen should come easier. 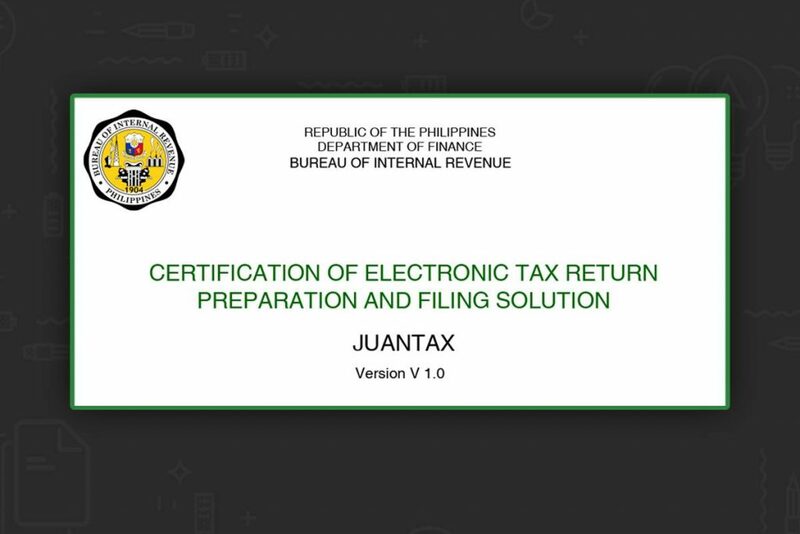 JuanTax will make compliance, more accurate and efficient. JuanTax envisions to cure current tax filing and collection concerns. Since the individual who is paying using the software is on top of the situation, he can be assured that his hard earned money gets channelled effectively. That’s a win-win for taxpayers, government and JuanTax.